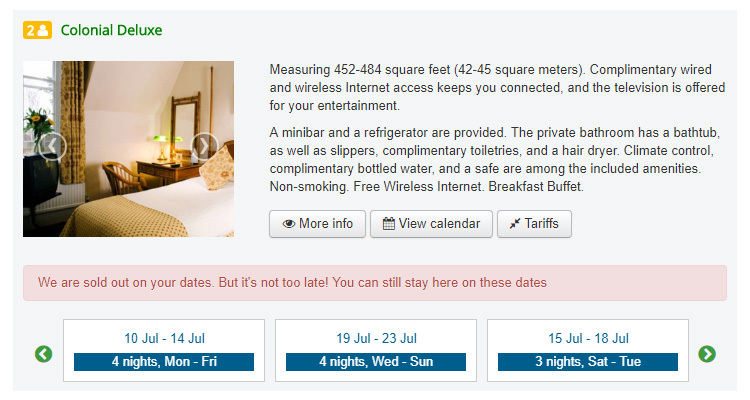 This new Solidres for Joomla plugin automatically suggest alternative available dates for your guest if their searched dates are unavailable, it provides significant improvements for both owners and guests: owners have a greater opportunity to retain guests instead of losing them while guests can choose another dates to stay at their favorite accommodations instead of having to spend their valuable time to find another one. In the initial release, when guest’s searched dates are not available, Flex Search will find other available dates by increase guest’s check in and decrease guest’s check out and record available dates to show in front end. In the plugin parameters, you can adjust how far Flex Search should search and what how many length of stay you want to show in front end. Note that this plugin does not perform an exhausted search because it’d affect your site performance. We will add more search strategy in subsequent releases.